Over the years I’ve written a lot of blog posts to debunk misconceptions or claims that weren’t true. Sometimes I publish the blogs posts but often I don’t. This is a pretty typical example post. Someone claimed that Google was evil for removing a particular domain, when in fact the domain had been removed from Google’s index via a self-service user request to our url removal tool. When we see misconceptions, we try to figure out where the confusion happened and how to prevent that type of confusion in the future. It’s also safe to assume when you read “Google cancelled my account” stories that there’s usually another side to the story, even if for some reason Google doesn’t go into the details. Zurich – On his blog, Benbit* from Zurich often discloses security holes of big companies. 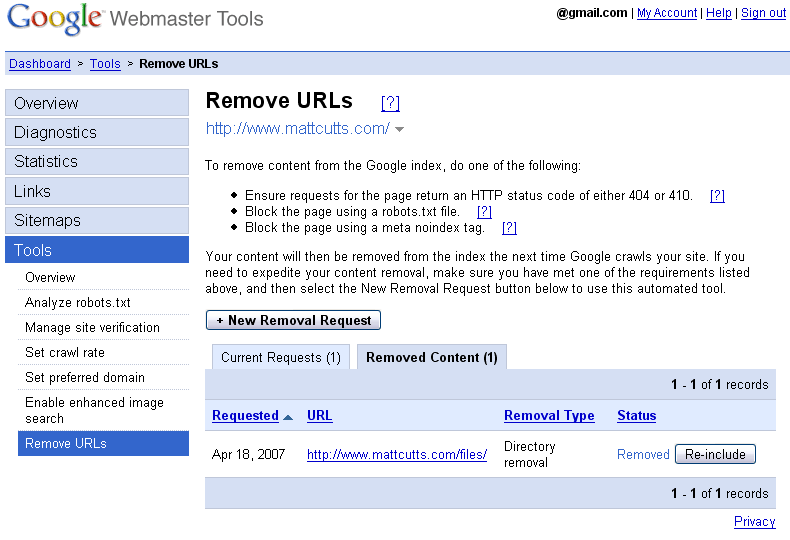 This makes him unpopular (see box) – so unpopular that Google kicked him out of the index. 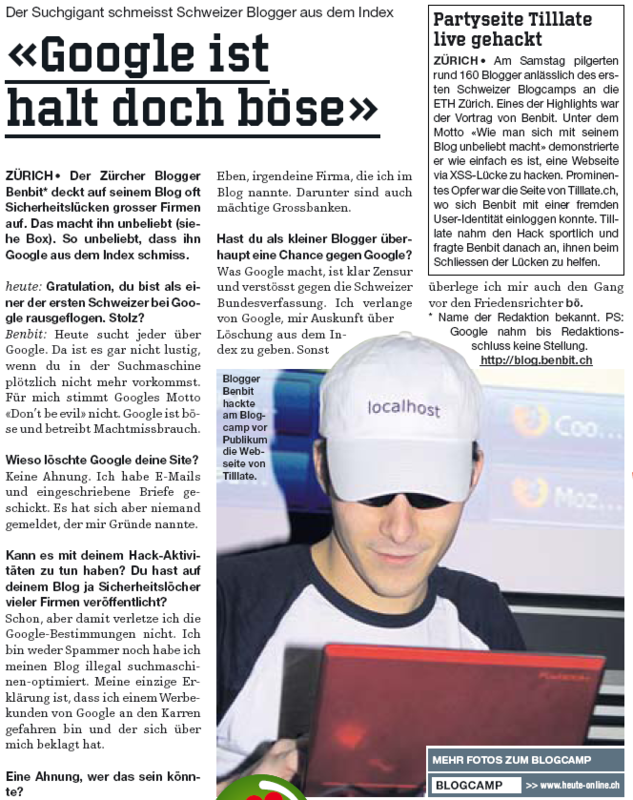 heute: Congratulations, you are one of the first Swiss citizens to be kicked out by Google. Proud? Benbit: Nowadays, everybody uses Google. So, it is not funny at all if you suddenly disappear completely from the search engine. To me, Google’s motto “Don’t be evil” is not right. Google is evil and misuses its power. Why did Google delete your site? I don’t have a clue. I sent emails and registered letters, but no one contacted me to give me reasons for this. Might it be possible that this is connected to your hacker activities? Didn’t you publish the security holes of many companies on your blog? I did, but this doesn’t violate Google’s guidelines. I am neither a spammer nor have I been doing illegal search engine optimisation for my blog. My only explanation is that I stepped on the toes of a Google advertising client who in turn complained about me. Well, one of the companies that I mentioned on my blog. Among them are also powerful major banks. As a small blogger, do you have any chance at all against Google? What Google is doing is a clear case of censorship and violates Switzerland’s federal constitution. I demand from Google to provide me with information about the deletion from the index. Otherwise, I am also considering going to a justice of the peace. * Name known to the editor. PS: Until our press deadline, Google did not comment. Okay, let’s pause for a second. At this point in the story, I think we can all agree that Google is 100%, pure, concentrated eeeeeevil. How dare they squash that poor, hapless blogger at benbit.ch? Except I haven’t told our side of the story. Our side of the story is pretty short: someone from benbit.ch used our automated url removal tool to remove benbit.ch themselves. Now why would someone from benbit.ch remove their own site (multiple times with multiple url patterns over multiple months, I might add), and then lay the blame at Google’s feet? I could speculate, but I genuinely have no idea. 1) site owners can easily see the urls that they’ve removed themselves. 2) site owners can easily revoke a url pattern that they’ve entered in the past. As you can see, I can easily view the removal url patterns that I’ve submitted, and there’s a “Re-include” button if I decide to revoke a removal and start showing the urls again. – Sometimes people say negative things about Google. Remember that there is often another side to the story. – Even when people say negative things, folks at Google do listen and look for ways to improve. Case in point: the newer url removal tool resolves a whole class of potential misunderstandings like the one above. I’m glad that the webmaster tools team works to make it easier to debug and to fix lots of issues for site owners. If the tool had launched just a month or two earlier, the folks at benbit.ch could have diagnosed their issue themselves — but at least everyone can benefit from the better tool now.